Android is the most popular operating system in the world and powers a wide range of phones across every budget category. As it is deployed on more smartphones across the globe, the affordability and availability of phones running on Google's OS increases by manifold. In an overcrowded market like India, companies like Google, Xiaomi, Samsung, Nokia, Huawei and OnePlus among others, offer compelling options. Sometimes, it can get tad a bit difficult to choose a perfect combination of screen, performance, software and design which is where we come in. 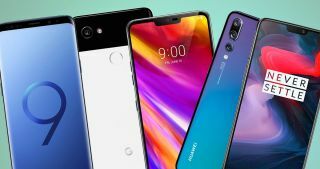 To help find the most fitting Android phone for you, we've rounded up the best Android handsets out there today, rating the phones on hardware performance, OS upgrade potential and, of course, how shiny and nice they are to have and boast about to work colleagues. Listed below, are the best phones that are powered by Google's Android OS. If you're on the lookout for an Android smartphone, here are the best Android phones money can buy today. If you're looking for a the best camera phone on the market, look no further. The single rear snapper on the Google Pixel 3 XL (and the smaller Pixel 3) is the best we've come across. You also get a big screen, decent battery life and plenty of power under the hood, making the Google Pixel 3 XL a great all-round flagship smartphone. The Google Pixel 3 XL marries the best camera phone we’ve ever tested with a sizable OLED screen. It’s the right fit for people who don’t mind the notch cut out at the top and have already adjusted their grip for bigger smartphones in the past. The Samsung Galaxy S10 Plus packs the best of what Samsung has to offer. It is loaded with features such as the Super AMOLED 6.4-inch display, wide-angle lens, longer battery life, plus there's a fingerprint scanner embedded in the display. Thanks to the larger 4,100mAh battery inside, it is able to provide more juice to the Galaxy S10 Plus and you also get Samsung's new Wireless PowerShare, allowing you to wirelessly charge other devices on the rear of the handset. The trio of cameras on the rear of the Galaxy S10 Plus are among the best on the market, offering more features, shooting modes and overall clarity. The price of flagship phones are rising every year, but you don't need to pay top dollar for a top-notch experience. OnePlus offers flagship phones at a lower price point and while its first few handsets didn't trouble the established names, its more recent efforts have really pushed the likes of Samsung, Apple and co.
You get the latest flagship power under the hood, a huge screen, dual rear cameras and an in-display fingerprint scanner included with the OnePlus 6T. The OnePlus 6T is a good-looking and powerful smartphone that can compete with handsets from the larger and more established brands on the market while undercutting them in price. The Huawei Mate 20 Pro is the best phone from the Chinese firm to date, offering up a heady mix of design, power and performance with a party piece in the form of an in-display fingerprint scanner thrown in too. The Mate 20 Pro packs a huge 6.39-inch display giving you a lots of space for gaming and movies, and its QHD resolution and HDR10 support ensures everything looks great. It also comes with three rear cameras, nabbing the excellent 40MP wide-angle and 8MP telephoto lenses from the P20 Pro - but the third sensor is new. It's an ultra-wide 16MP snapper allowing you to cram even more of your surroundings into each shot. The Mate 20 Pro is a full-featured phone for a full-featured price - it even has a few tricks you won’t see elsewhere, and more powerful specs than most of its competitors. The LG G7 ThinQ is a confident step up from its predecessor - the LG G6 - with LG allowing itself to be a little bolder with the design and features on its latest flagship Android phone. Its display comes with an ultra-bright mode which boosts brightness to an eye-dazzling 1000nits, handy if you're desperately trying to Instagram your latest snap from the beach. The AI built into the camera can recognize what you're shooting and adjust the settings accordingly, to give you the best shot. There are two cameras on the rear of the G7 ThinQ, with the secondary snapper offering up a super-wide angle lens to give you a different perspective on things. We just wish LG would drop the 'ThinQ' part of the name.